There are 66 variations of the standard game, each featuring a unique combination of settings. When I devised the competition between my friend and I where we play every video game we collectively own, I knew witnessing the growth of the medium firsthand would be a plus. Now that we’ve played through my collection of Atari 2600 games, I’ll flood the internet with my thoughts on selected titles. I’ll begin with Asteroids. Asteroids is a classic. Originally released as an arcade game in 1979, it’s heralded as one of the most popular and influential video games of all time. It was released for the 2600 in 1981 and while it differs from the arcade version, it’s a fun version of the game nonetheless. 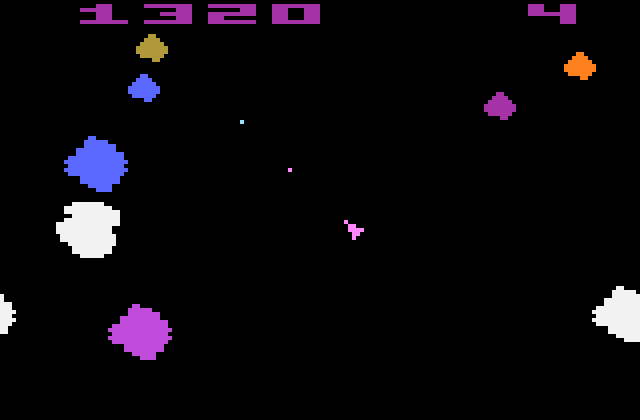 Asteroids for the Atari 2600 looks much simpler in comparison to the arcade version (pictured below) but it seems to replicate the gameplay very well. I’ve never been a huge fan of the game, although this session something “clicked” and I got it. The thing that I’d been missing in all of my previous experiences with Asteroids was competition. Without another person to compete against, the game is unfulfilling, unless you’re a person who is adamant about besting a personal score. Learning to effectively steer and thrust the spaceship is the first key to success. The spaceship’s tendency is to remain still. If I’m not pushing the thrust button, it’s not moving. So when I press it, the spaceship only moves for as long as I press it before coasting to a standstill again. Piloting this spaceship wouldn’t be of much concern were it not for the unbridled asteroids whizzing through space. 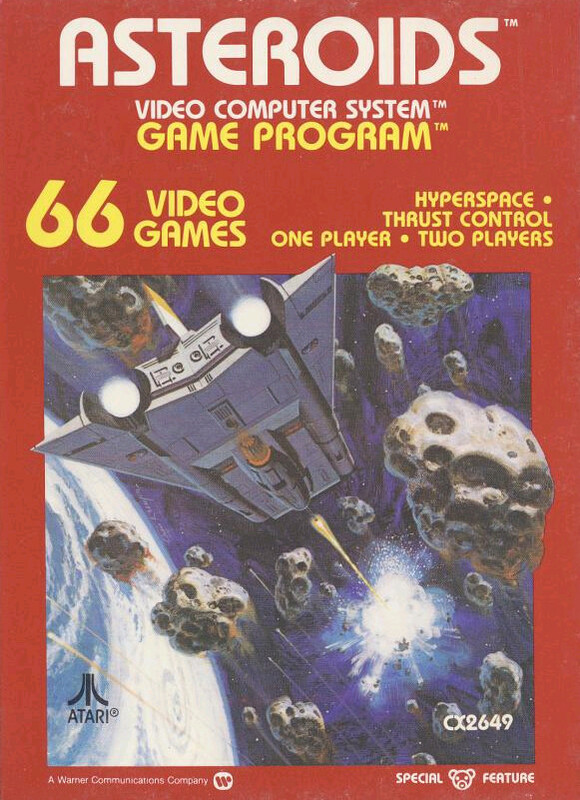 The single screen that Asteroids takes place in is chock full of the game’s namesake as well as the occasional UFO. Lucky for me, I was piloting a spaceship that was prepared for the unknown, kind of. As the spaceship is traveling in a potentially dangerous screen of space, it’s naturally equipped with weaponry. However, like modern-day NASA, I imagine the makers of this spaceship were also suffering from a reduced budget because its weaponry doesn’t outright destroy large asteroids but breaks them into smaller ones. Managing them was the second key to success. If I began haphazardly shooting, I’d rack up points quickly, but piloting around the leftover chunks of asteroids would prove to be overwhelming. 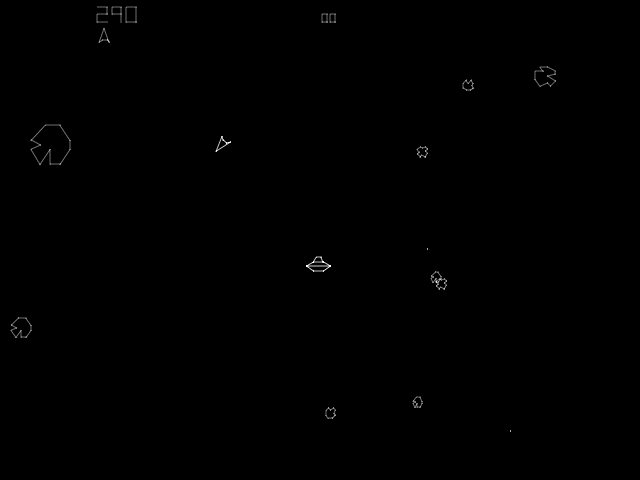 A screenshot from the arcade version of Asteroids. Playing a lot of simpler games has made me think deeply about video games. At their most basic level, they’re puzzles tasking us to understand their unique set of rules, adapt, and conquer them. Asteroids is so fun because of that formula. Controlling the spaceship and managing the destruction of asteroids are the two major aspects of the game, that’s really it, and with someone to compete against, it’s out of this world.